This whole roasted cauliflower cheese was inspired by a dish my mum cooked over Easter (hi mum! I can hear your squeals of delight from here!). It’s like your usual cauliflower cheese, but the cauliflower is roasted whole, rather than being chopped up into the sauce. This is good for two main reasons. Firstly, you need to use less cheese sauce. I know, I know, this sounds like a bad thing, but when you’re trying to eat a bit more healthily, a plateful of cheese sauce with a couple of token bits of cauliflower floating in it isn’t particularly acceptable, much as I would love it to be. This whole roasted cauliflower cheese has just enough cheese sauce that you feel like you’ve had something a bit naughty, without actually needing to entirely give up on your diet. Secondly, you get the wonderful slightly-charred flavour of roasted cauliflower, rather than the cauliflower just boiling itself in the sauce. 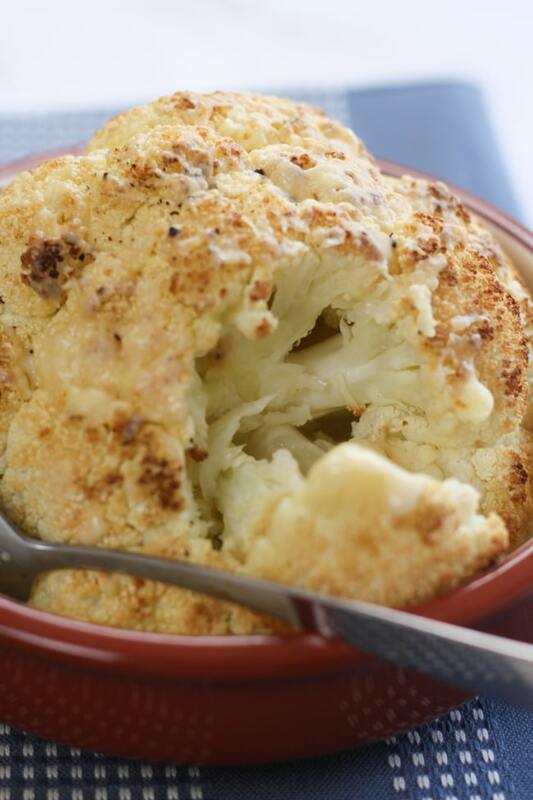 You know how obsessed with roasted cauliflower I am, so I love that the roasted flavour comes out in this recipe. So basically, a whole roasted cauliflower is the best of both worlds: roasted cauliflower, and cauliflower cheese. It’s neither, and it’s both. And it’s delicious. I’ll warn you now, the cauliflower does take a while to roast. You are sticking an entire vegetable in the oven, remember, so you can’t expect it to be done in twenty minutes. But, most of the cooking time is hands-off time, so don’t worry. Just pop it in an hour or two before your dinner needs to be served, and let it do its thing. I actually went pretty easy on the cheese sauce this time, because I was desperate to use this little round baking dish, which fitted the cauliflower perfectly, but didn’t leave a huge amount of room for sauce. Again, I was happy with this, because there was just enough sauce to be tasty but not too heavy – but if you’re feeling indulgent, feel free to double the amount of sauce! Remove the green leaves from the cauliflower, and cut off the end of the thick stalk, until you’re left with just the white head. 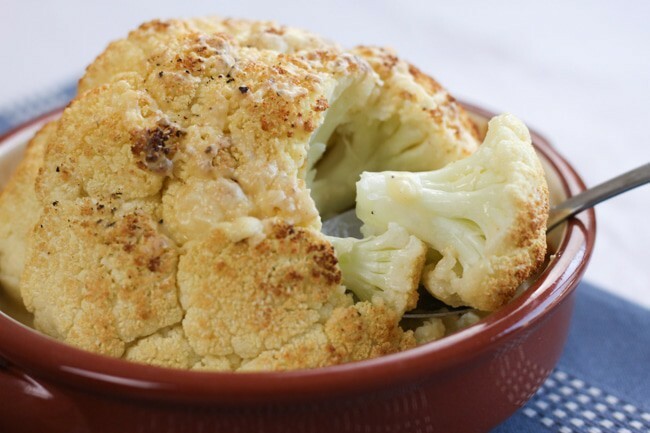 Wash the cauliflower thoroughly and, once mostly dry, rub it lightly with oil. Place in a baking dish and cover with foil. Bake for around 30 minutes. Melt the butter in a small saucepan over a fairly low heat. Add the flour and cook, stirring constantly, for 1 minute. Add the milk a little at a time, stirring until smooth each time before adding more. Allow to cook over a fairly low heat for a couple more minutes, until the sauce has thickened slightly, then add two thirds of the cheese, and mix until smooth. Season with a pinch of nutmeg and plenty of salt and black pepper. 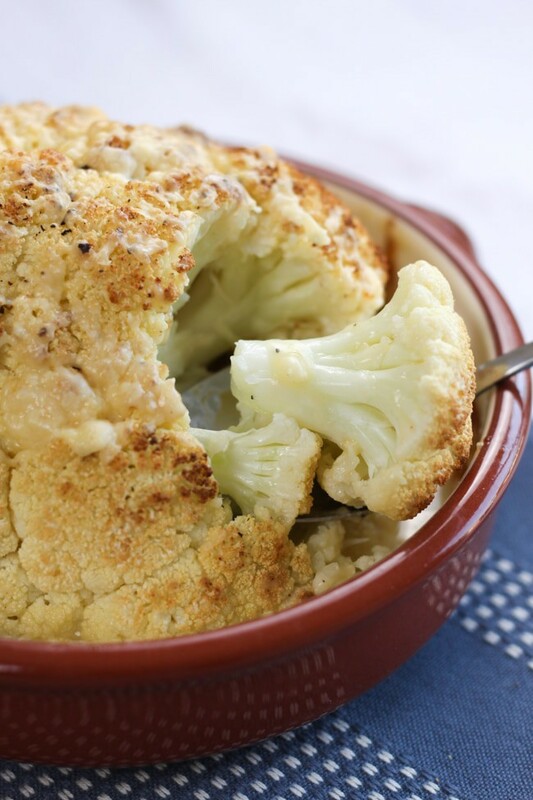 Remove the cauliflower from the baking dish, and drain away any liquid. Pour the cheese sauce into the baking dish, and replace the cauliflower on top. Add more salt and pepper if desired, then place in the oven, uncovered. Roast for a further 30 minutes, until slightly browned on top. Then, sprinkle over the remaining cheese, and return to the oven for 15 more minutes, until the cheese topping has melted and begun to crisp up. Don’t miss my low-carb cauliflower pizza – it’s even more delicious than it looks! This was the hit of my Christmas Day lunch, everyone loved it. It was so easy to prepare, no worrying over pre-cooking/over cooking of the cauliflower. Just enough cheese sauce, even my dad liked it and he hates cauliflower in sauce. Mainly because he had only ever had soggy overcooked cauliflower, he likes it to still have some crunch. Thanks so much Cheryl, that’s such lovely feedback! I’m so glad you all enjoyed it and it added something to your Christmas dinner :) Happy new year! This looks so good! My kids would be all over this, thanks for the recipe!! Make him taste just one bite and then he’ll be hooked, it’s so so good! this looks so so yummy!! I want to sit down with that whole dish on my lap and just dig in! Yum yum. You must try it Camilla, it makes the cauliflower so much tastier! Saw this earlier and thought mmmmm. Then walked past the cauliflowers in the supermarket earlier and HAD to buy one. 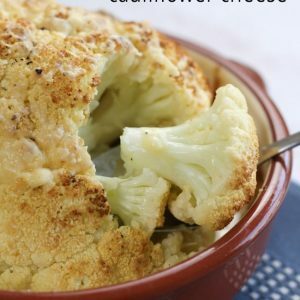 We are obsessed with cauliflower here and I actually made a gouda baked cauliflower last night! Love the idea of keeping it whole!! Oooh I LOVE gouda, that sounds lovely! Yummy! I just made the traditional chopped up cauliflower and cheese baked dish earlier this week but will definitely try this next time I prepare it. 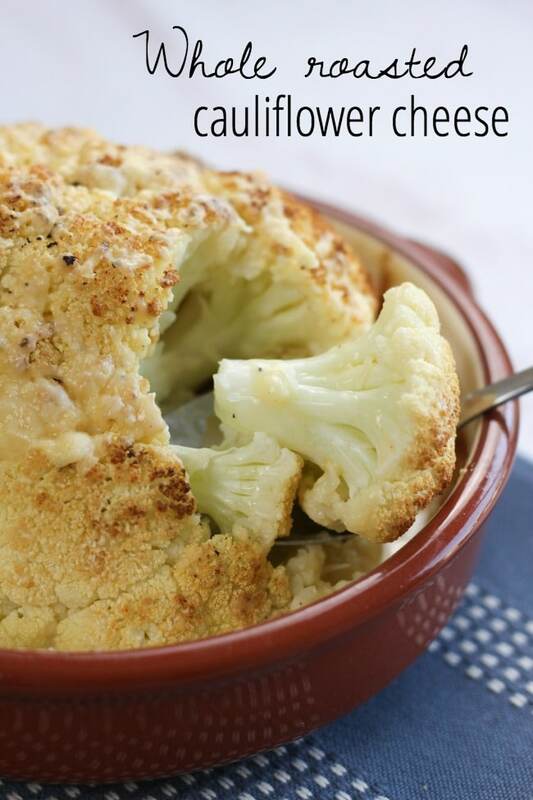 Okay, I am normally not a cauliflower fan…but these pictures make me want to try this! Looks so delicious! Thanks for sharing. I actually didn’t like it until a year or two ago but now it’s one of my favourites :) give it a second chance!! It’s always nice to have anew twist on a classic :) I love the look of your cauliflower pizza as well ast the bottom so will be reading that next! You definitely need to make the cauliflower pizza, it’s SO good! The only other person that I know that makes a whole cauliflower cheese is Ed’s mother. It really surprised me when he produced a whole cauliflower cheese the other day. Haha!! It does a bit doesn’t it ;) but believe it or not I don’t try to eat alllll the cheese, it just usually ends up that way! 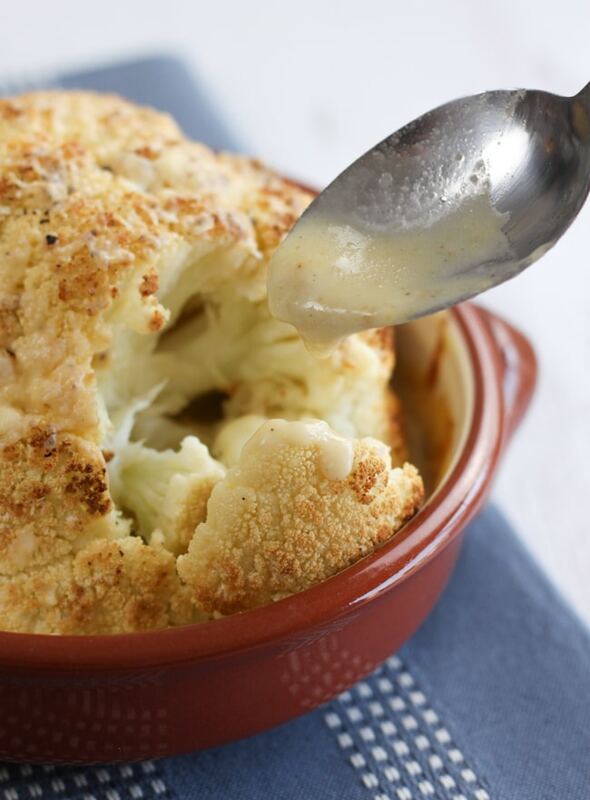 Put me down for some of this – LOVE cauliflower cheese! Also liking the cauliflower pizza – YUM! 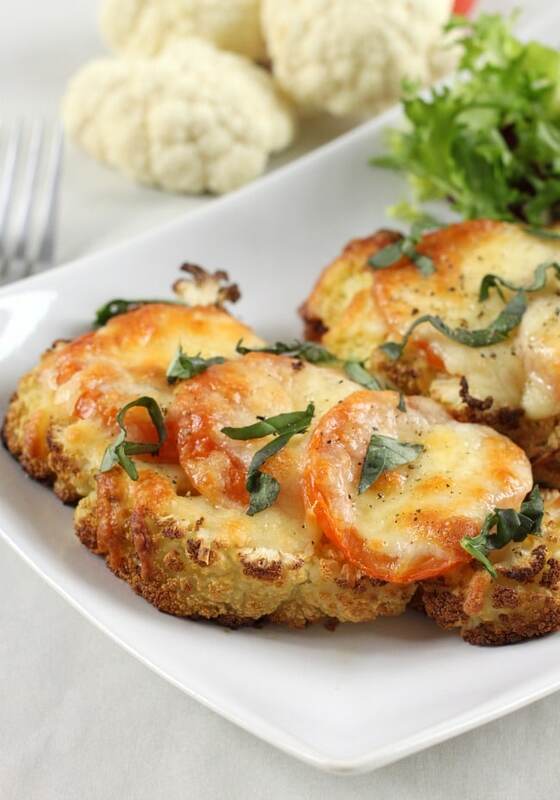 The cauliflower pizza is SO good, and so easy, you must try it! Love the look of a whole cauli done this way! 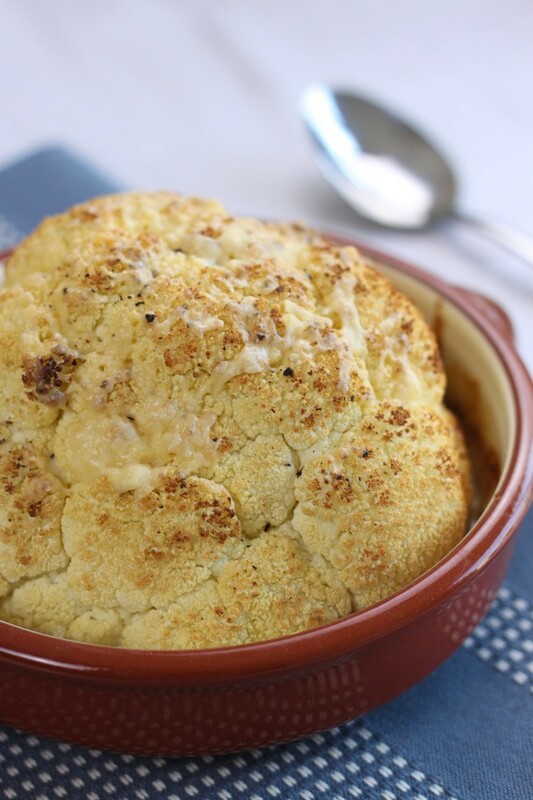 The cauliflower looks wonderful! I don’t know why I seem to miss buying cauliflower and I really love the taste. Thank you for the reminder and I’ll be roasting one soon.